The hospital was started with the main objective to serve the rural community in health and medical sphere. It caters to the needs of the general population at large over a wide area aound Sakthi Sugars factory at Sakthi Nagar. The hospital is well equipped and provides curative therapy including various surgical procedures, physiotherapy and also a comprehensive eye care treatment including implantation of artificial lenses. It also offers intensive cardiac care services, endoscopy, gynaecological and obstetric services, orthopaedic, dental and ENT services on a regular basis. It is a government approved centre for Family Welfare programmes. 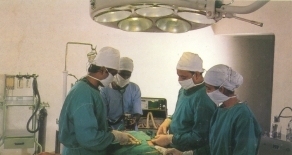 The treatment and surgery are performed at nominal fees. A Laparoscope Unit has been set up to perform surgery both in general surgical and gynaecological fields in the hospital. A library with books and journals on latest and advanced fields in medicine is available. Free Eye camps are conducted every year. Immunisation programmes are carried out for eradication of polio, measles, etc., are carried out free of cost. Hepatitis -B vaccination is being administered to adults and children.